Today, I am announcing that I am to hold an information event, in conjunction with the National Lottery, for community groups and charities in Delyn to offer information on funding available to them from the National Lottery. On the 28 October, from 12.30-14.30, the National Lottery will deliver a 45 minute presentation on their open grants with a few tips on improving applications. This will be followed by an opportunity for funding advice to be given to groups after the presentation until the event closes at 2.30pm. The event will be held at Flint Town Hall (CH6 5NW). Those wishing to attend this free event should respond no later than 5pm on 21 October 2016. This is an excellent opportunity for our local community groups and charities to learn about the various different types of funding available from the National Lottery. Not only will you be able to learn about the funding available, but two representatives from the National Lottery will give tips and advice on how to improve your chances of securing funding. Delyn has already benefited from a huge amount of National Lottery funding. Only recently Carmel Village Hall secured funding to help improve facilities. I hope as many of you as possible attend. So if you run a charity in Delyn or a member of a local community group and you are looking for funding this is the event for you. It is important that you gain access to funding and support that you are entitled to. 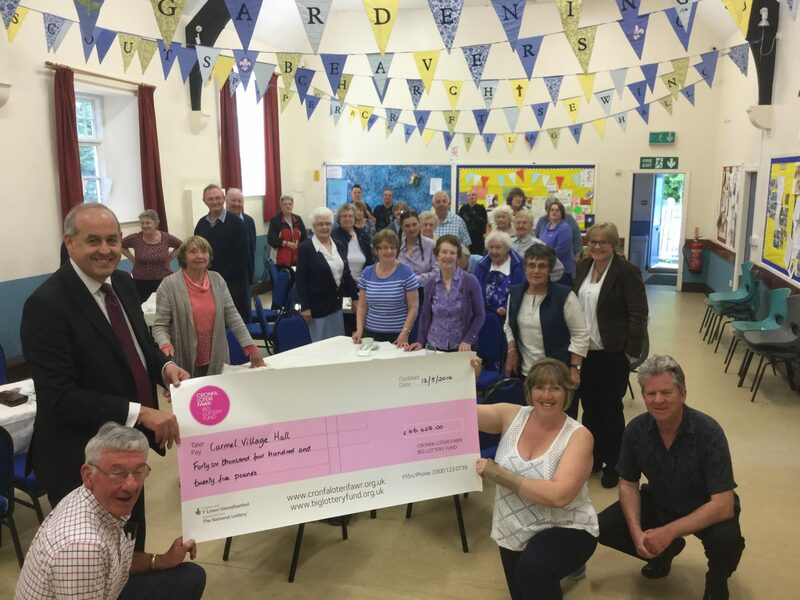 *The above image is of Carmel Village Hall receiving its cheque from the National Lottery.